Hidden Garden In LA Times "Love In Bloom" Article! I was so excited to be interviewed for Debra Beyer's "Love in Bloom" article that appeared in the Sunday, November 15th edition of the L.A. Times. 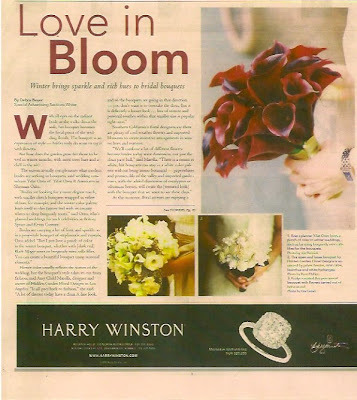 The article is about winter bridal bouquets and what influences their design; is it the season, fashion, or the bride's personal style? The answer is all of the above! A bridal bouquet can be thought of as an accessory. How a girl accessorizes an outfit changes seasonally - in the fall/winter months who can resist a knitted scarf whereas in the summer a cotton scarf is a much more popular choice and the pattern and colors of the scarf a girl chooses in fall, winter, or summer, can all be chalked up to trends and personal style! The same is true of flowers. A-line dresses are hot right now and so are looser bouquets. Signature pieces of jewelry never go out of style and more and more brides are incorporating heritage pieces of jewelry into their bouquets in order to personalize them. Check out my advice and also wonderful advice from other talented L.A. florists interviewed for the piece: Yifat Oren, Gilly, Krislyn Komarov and Eddie Zaratsian. This Thanksgiving we are thankful for the wonderful year of business we have experienced here at the The Hidden Garden. When you allow us to bring your visions into reality our staff is given the opportunity to use their creativity and talent on a daily basis. We appreciate your continued business over the last ten years and wish you and your loved ones the best of Thanksgiving meals and the best of company today. Here is a sneak at some of the work your patronage has allowed us to create this week. Dressing up your Napkins for Thanksgiving! One more day until Thanksgiving and you are probably busy pulling all the details together. 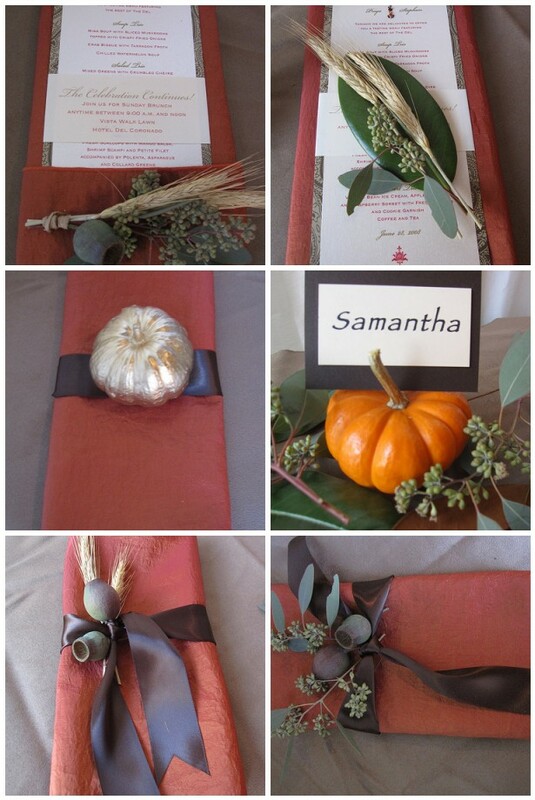 We came up with a few creative ideas to help you dress each place setting in Thanksgiving style. You can use pumpkins as a name card holder by cutting a thin slit on the stem of a mini pumpkin. For a little more pizzazz, try spray painting mini-pumpkins in a gold color to place as an accent on top of the napkin. Don't forget to bring the outdoors in, just take a step outside and pick some leaves add some dry wheat for texture as well. Combining rich satin ribbon to bright colored napkins makes for a splash of color as well. Whatever you do, just let your creativity run wild and remember to enjoy the process as much as the end product. Thanksgiving is in full bloom at the Hidden Garden this week. 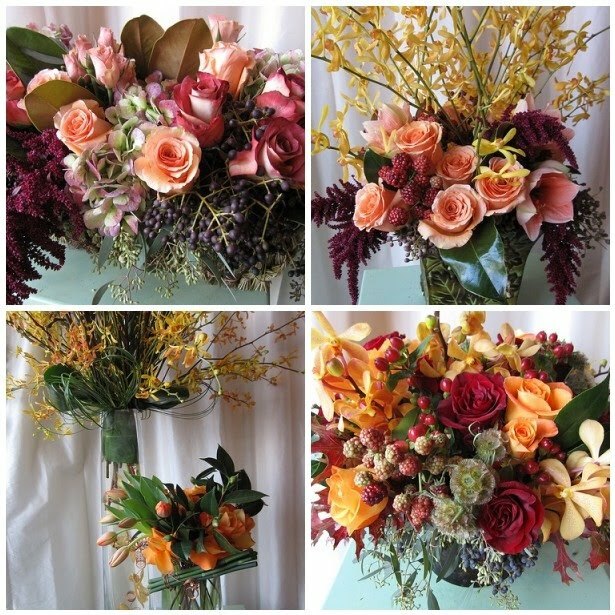 We just wanted to let you take a peek at some of the arrangements that have been going out the door! We have been incorporating lots of texture into our arrangements. As you can see our design team is having fun with oak leaves, privett, ornamental rasberries (we love incorporating fruit into our designs, whenever we can) as well as the soft and velvety feel of dusty miller. It's not too late to place your Thanksgiving orders. Remember arrangements are not just for your holiday decor, it's also a thoughtful way of thanking all the people in your life for the love and support they have given you, your family or business throughout this past year. What a nice thoughtful way to show them your appreciation. 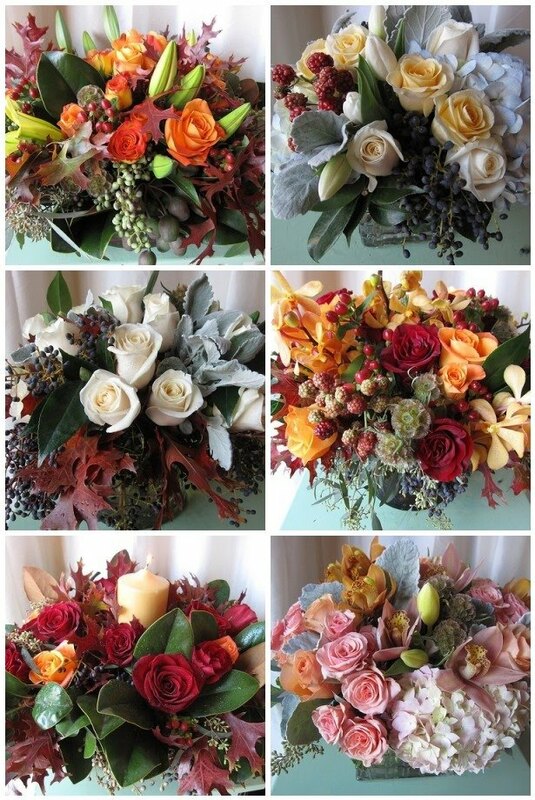 Season changes offer lots of different opportunities to incorporate different colors and textures into floral design, we love the fall with all it's rich hues and interesting textures, we look forward to what the upcoming winter will bring and can't wait to show you what we have lined up for the Christmas season. The use of flowers are an important part of Indian Weddings because they are a symbol of creation and regeneration, and it is believed that flowers bring good luck and happiness. 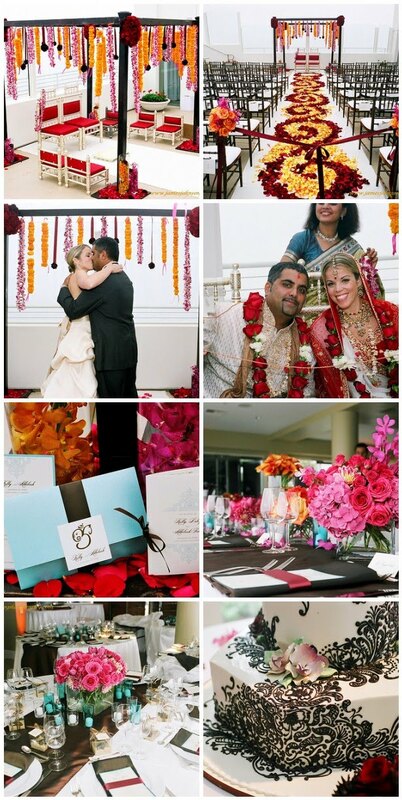 Kelly (our gorgeous bride) fused Western Traditions with her husbands cultural traditions throughout their wedding. The aisle was covered in a swirl pattern of red and orange rose petals which led to the ceremony area also known as the Mandap structure. In the Mandap, there were garlands of Dahlia's and Marigolds. During the marriage ceremony, the bride and groom are draped in a necklace made of red roses which symbolize their union (which was provided by a family member). In the reception area, the color palette took on a more cool hues of turquoise and hot pink with bright oranges. The cake design evoked the ancient Indian Tradition of Mehndi common in many Indian celebrations. This beautiful celebration was planned by Julie Pryor and photographed by James Johnson. One of our more recent weddings was held at the beautiful Calamigos Ranch. We have done many weddings at this exquisite location but each celebration manages to reflect the uniqueness of each couple and a whole new environment is created each time. With this particular bride and groom they choose a classic romantic white wedding theme for the ceremony. 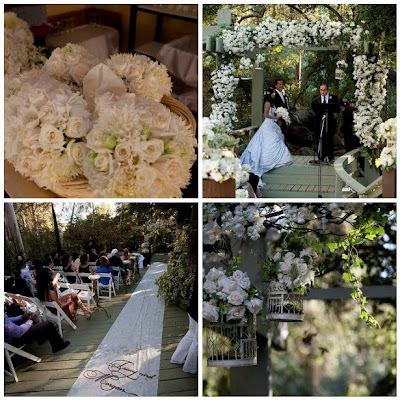 We used hundreds of white roses on the arbor as well as bird cages hanging above the walkway overflowing with roses. The couple walked down the aisle on a custom made aisle runner that had their name written in exquisite calligraphy. The bride's bouquet was a cascade of textured all white hydrangea, roses, and white dendro a foot and half long. The stems were wrapped in white french satin ribbon. 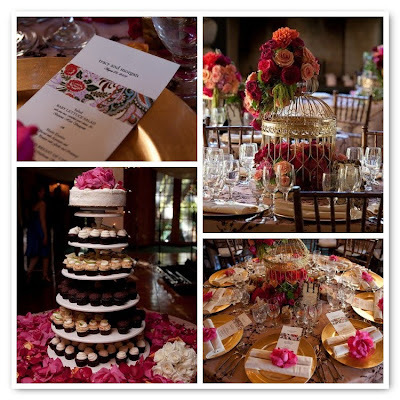 The reception welcomed guests with a burst of color. Here the bride and groom opted for the hues of reds, magentas and orange. The birdcage theme was also present at the dinner table with beautiful gold birdcages filled with rich vibrant florals cascading outside the cage. For these unique centerpieces we used amaranthus, roses and a touch of green ivy trailing. The "cupcake table" was covered in pink and red rose petals and the top was a white layer of cake topped with red roses. We would like to thank Lawrence Crandall for his beautiful photography. I loved the simplicity of the wedding ceremony for Amy & Sam. Set beneath a gorgeous oak tree overlooking the Ojai Valley you couldn't ask for a more picturesque site for their exchange of vows. The Hidden Garden created a soft white chiffon chuppa structure with simple floral tie backs for this romantic setting. The aisle was strewn with white rose petals atop the grass and adorned with mossed cones filled with lavender hydrangea. It was truly romantic. We have to give credit to Mother Nature who played a perfect roll in the ceremony, as she provided a slight breeze allowing the chuppa curtains to billow ever so gently in during the ceremony. Thanks to Julie Pryor from Pryor Events for allowing us to design the florals for the wedding & Isabel Lawrence, the amazing photographer who provided us with our images! 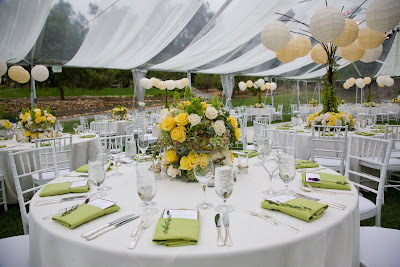 Yellow, Celadon and Amethyst Wedding....a combo that's fresh! The Hidden Garden had the pleasure of designing the most breathtaking wedding for Amy & Sam at Ojai Valley Inn (one of my favorite spots!). There were so many fantastic lovely details to the event so i have to share this to you over a 2 day blog post! The color palette for the wedding was yummy....soft butter yellow, celadon green, ivory and pops of amethyst! I love the fact that Amy wanted to use yellow as a hue for her flowers as it is an often an "overlooked" choice by most brides. I can't say why (i personally used the same color at my own wedding) because the only feeling you get when you see yellow is HAPPINESS! The amethyst accents are so prevalent in fashion that its only logical that we will start to see this pallet filter over to a brides choice for color at their wedding. The bridal bouquet was so delicate and frilly with the lily of the valley incorporated into the mix. 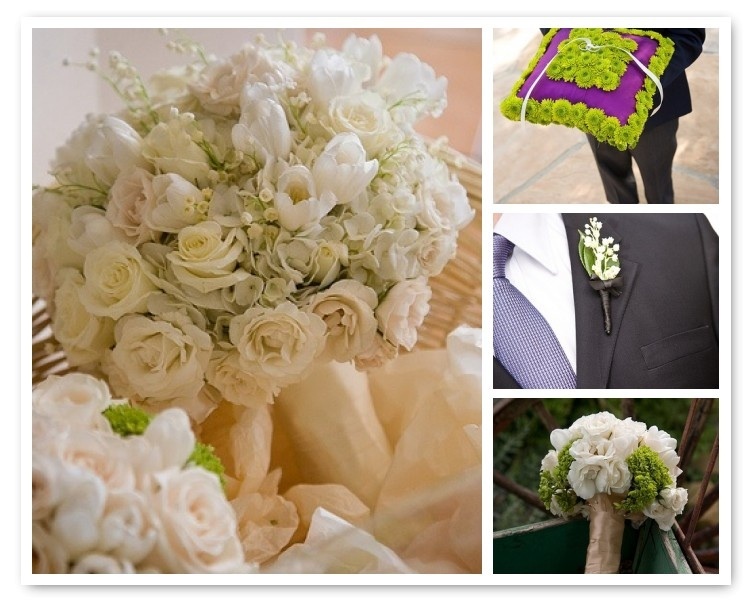 Lily of the Valley is such a popular floral choice for bridal bouquets. When used as the only flower it is often an expensive bouquet but much more economical when you integrate with other floral blooms such as roses, hydrangea & tulips. Sam's boutonniere was a complimentary accent to Amy's bouquet....the delicate lily of the valley. Our bridesmaids bouquet were fresh and crisp with bright white & celadon green hydrangea pops! Here comes the amethyst....our ring pillow! Vibrant and Fun! Thanks to Julie Pryor from Pryor Events for allowing us to design the floral for the wedding. Isabel Lawrence is the amazing photographer who provided us with our images! 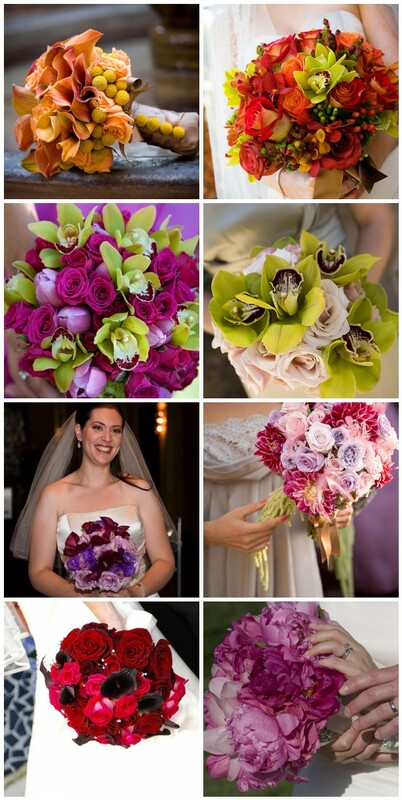 New Blog Post For Inside Weddings; Customized Bouquet Handle Treatments! 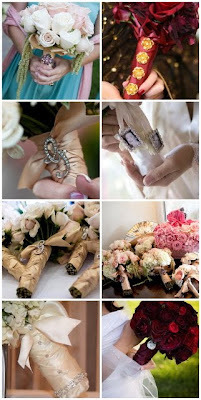 I am amazed at how creative brides are getting with everything from their place card tables to their bouquet handles. I love that a finished bouquet includes a beautiful handle. 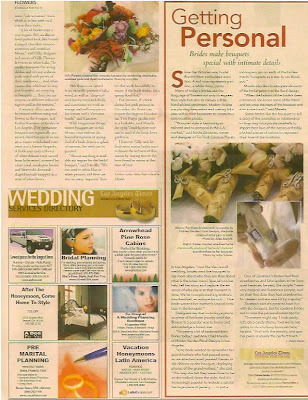 Whatever your personality, or wedding décor, there is a treatment perfectly suited for your big day. Enjoy the pictures below and check out my new post on InsideWeddings.com here for all my ideas! Not too long ago, The Hidden Garden opened its second location at Four Seasons Hotel Westlake Village, which has given us the wonderful opportunity to work with clients and industry professionals in Northern Los Angeles, Ventura and Santa Barbara counties. 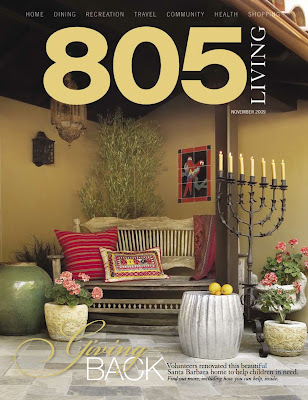 Everyone we have met has been extremely welcoming, including the go-to lifestyle magazine for everyone in the 805 area code - 805 Living. 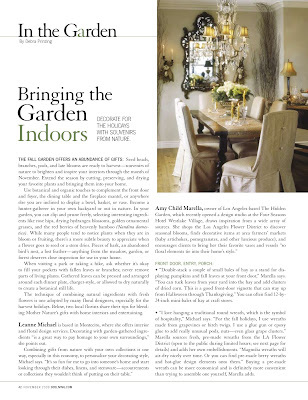 I was thrilled to be included in Debra Prinzing's article "Bringing The Garden Indoors - Decorate For The Holidays With Souvenirs From Nature," that appeared in the November 09 issue of 805 Living. 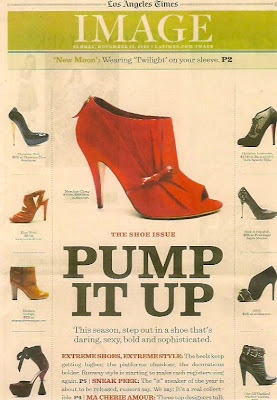 Check out the article above, or pick up a copy before it's too late. I hope you'll enjoy putting my tips to use on how to bring the outdoors in, seamlessly incorporate floral elements into your holiday décor, add autumn details to your porch and mantel and much, much, more. As always if you have a question, or want my take on an idea you have this holiday season, leave a comment and I'd love to help! More often than not, we get several requests that warm our hearts. Karen & Doug were married 5 years ago at Skirball Cultural center and we were honored provide the "floral magic" for the elegant affair. Doug contact The Hidden Garden a couple weeks ago and said he wanted to recreate the flowers from his wedding for their 5 year anniversary (which was just this past weekend) Too cute....I know! It didn't take our team very long to pull up the details (and photos as you can see) to help recreate their magical day! It's always our pleasure to help keep the romance alive! Happy Anniversary Karen & Doug! Congratulations to the many couples who have allowed us to be part of their special day! We recently had the pleasure of working with Linda Howard from Sensational Celebrations on Sarah & Daniel's wedding at Bacara Resort in Santa Barbara. The Ceremony site had the most breathtaking view of the ocean which helped in the final decision for the decor elements chosen for their wedding vows. Simple clusters of white florals, water, driftwood and beach glass were incorporated to the already magical setting. The reception was in the amazing Rotunda Room. Elements of water and sea glass were still incorporated with the added feature of "light" giving the tables a slightly different decor element than the ceremony site. 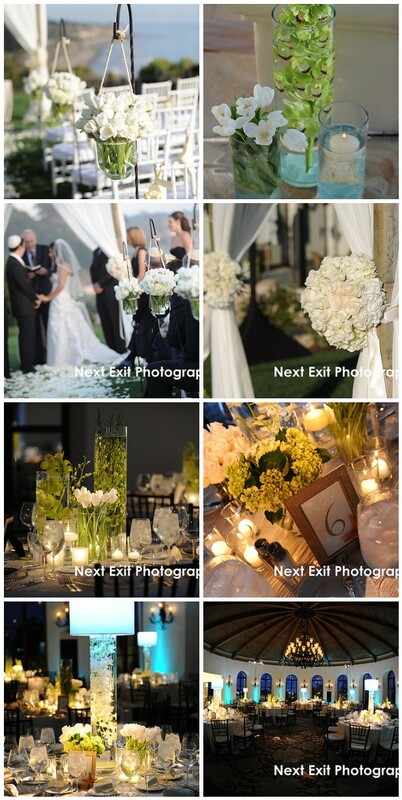 Thanks to Next Exit Photography (amazing photos!) and Keith from The Lighter Side....we created a magical dinner reception with "light"! On Halloween morning I took some time to peruse one of my favorite blogs, Weddingbee Pro, and came across a great post by Nancy Liu Chin, "Behind The Scenes: Bear, Bear, Bear," that had sparked many comments. While reading the comments I found one that posed a great question, "Why can a florist charge $250 for a bouquet when a bunch of those flowers are sold at Whole Foods for $12.99?". I politely responded to her comments with some key points; Whole food buys in bulk and florists place special orders ensuring brides get exactly what they want, which means you're paying for peace of mind. Shortly after I left this comment Nancy contacted me to offer more insight on the issue of floral design costs, value and pricing. Here is an excerpt her first post on the subject, "Ask Nancy: $12.99 For Peonies Part I." Dear Nancy…Not to be snarky, but can you please explain why my florist charged $250 for a bouquet of peonies when I found an eight stem bunch at Whole Foods that very same week for $12.99? This question can be answered in so many ways. Let’s assume that this is about “perceived value” which is defined as a consumer’s opinion of what a product (or service’s) value is. Often, this unique perception has little or nothing to do with the actual product (or service) price and is dependent on the product (or service’s) ability to satisfy the needs, expectation and requirement. After consulting with floral designers, Audrey O’Brien of Studio Stems and Amy Marella of Hidden Garden Flowers for their input to this question, I realized that no matter what we collectively came up with to explain why the florist charged what she charged, ultimately Lisa didn’t see the value of a $250 bouquet of peonies. - the florist has other expenses like overhead, production, office expenses, and nonoperating expenses that might factor in. - the time that the florist probably spent finding just the right flowers, processing each stem, picking flowers up in the wee hours of the morning (except yours truly here! ), and nursing them so that they would open just right. - the experience, years of practice, and knowledge that the florist and his/her staff have acquired. - the art and creativity that goes beyond just the flowers themselves. That there is an art in selecting the right flower and designing them. There is creativity in even the simplest of arrangement. There is a talent in being able to combine different ingredients. 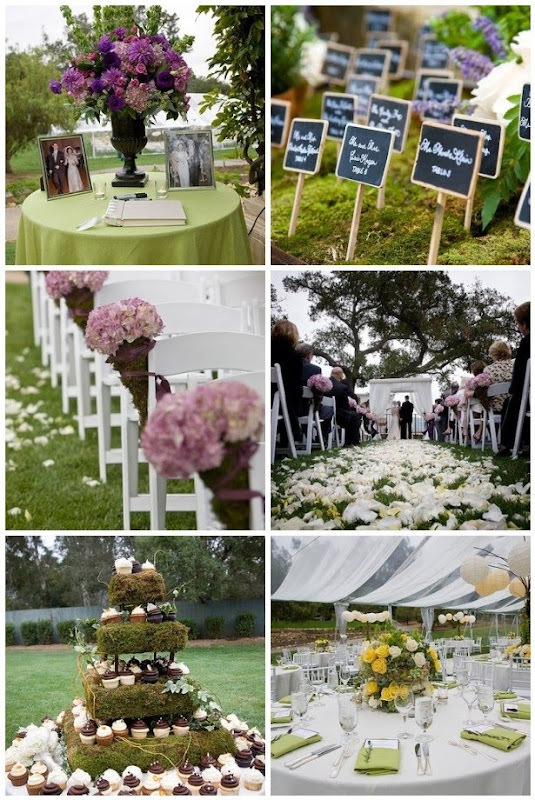 There is creativity in designing a wedding from start to finish with taste, polish, and style. - the stress and pressure that many florists and vendors must go through given the importance of the day. You can’t redo! Bottom line: It’s up to us, floral designers, to find the clients who will understand and appreciate the art that we are creating. It’s up to us to educate the clients so that they can see the value and difference. READ MORE HERE. A couple days ago, I started to answer the question to Lisa's question. Of course I wrote about Perceived Value and Pricing. 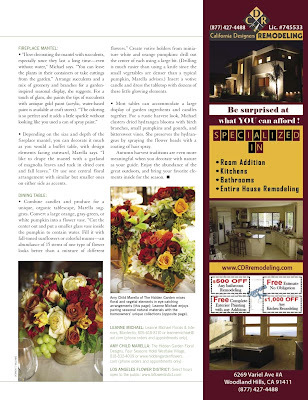 It is not uncommon to find Whole Foods, Trader Joes, Costco with a wide assortment of flowers. These wholesale warehouses and grocery chains buy their flowers in "bulk" and/or buy flowers that are "flushing" from the growers. I had never heard this term before Amy used is. Amy was kind enough to help define the term. "Flushing" occurs when flowers are coming in great abundance and the grower is willing to get rid of them quickly/cheaply because they have a very large quantity. Amy states, "this is not to say that the flowers at these locations might not be perfect but they are not hand picked by the buyers". Given that - each week these outlets have differing stock. There is never a guarantee of what you might see at your local grocery store like Whole Foods, Trader Joe's and Safeway. These large corporation have the buying power to purchase in "bulk" therefore offering consumers much lower prices than a local floral shop who doesn't buy in the quantities that a large, national grocery store could. 2) Precision - Pre Orders As a floral designer who specializes in weddings, often a proposal is set months, weeks in advance. I don't have the luxury to "randomly" select flowers for my wedding clients. Amy and I both realize that we have to "pre order" our flowers. Many and we assume the florist in this question probably pre ordered the peonies way in advance. I prefer to write my orders about 2 weeks. Sometimes I have to give a month notice. Pre ordering ensures that the "exact" flower to the color and to the stem count is ordered. Floral designers all want the right amount of flowers and the best blooms though often there is no guarantee because flowers are natural and perishable products. You can't just go get a peony whenever you want. Given that floral designers are ordering in advance, you don't get a price break. In many instance, a florist actually pays a slightly higher premium to guarantee that the flowers they need for a wedding are EXACTLY what they want. Amy's company, The Hidden Garden, does exactly thing. She says, they " might cost a little more across the board but with that comes piece of mind for the bride". Obviously, considered floral designers want to delivery what a client ordered so you can't just take a chance that the right quantity, color or flower will just "show" up at the market. That's way, banking on a Whole Foods for your wedding flowers - not a good way to go. I don't think it's fair to compare the peonies that a floral designer can get with the price of flowers at a local grocery store. Because if you can't get it consistently in the color, quantities and quality, why do it? READ MORE HERE. I am really happy this came up and I was able to answer a question so many brides have and reveal all of the hard work that goes on behind the scenes at The Hidden Garden. I would love to hear more thoughts on this, so please leave a comment! Flower Market Find: Hail for Kale! Kale is not only a healthy vegetable full of anti-oxidants, it is also a popular element in floral design providing a great texture to any arrangement. 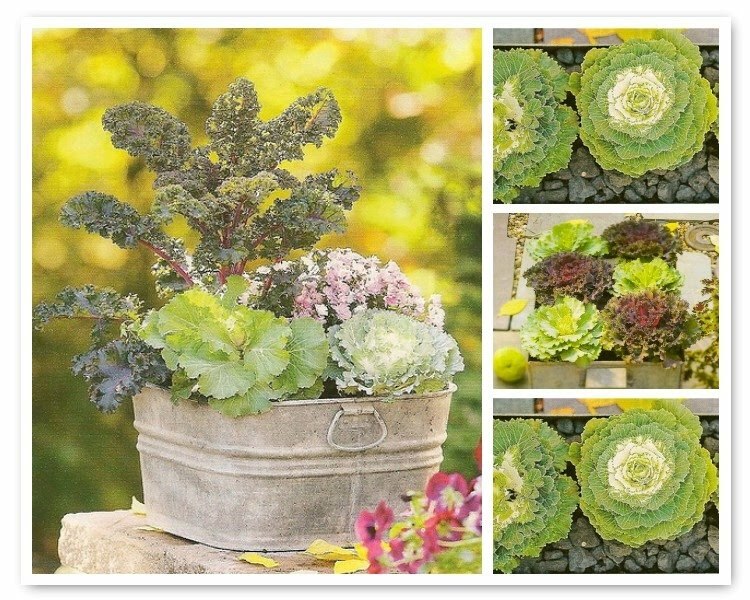 Often called ornamental cabbage, it comes in a variety of colors like shades of greens, purples and whites. It's now in season and growers are bringing a beautiful selection to the mart. Expect to see arrangements this season that incorporate kale...it puts a twist on regular flowers! For those of you less inclined to make pumpkin soup or pumpkin pie from scratch, here are some creative uses for all those left over pumpkins from Halloween. Just because one holiday is over doesn't mean you can't continue to use pumpkins for the Thanksgiving Holiday this month. Add decor to your front entry by lining your walkway with pumpkins. 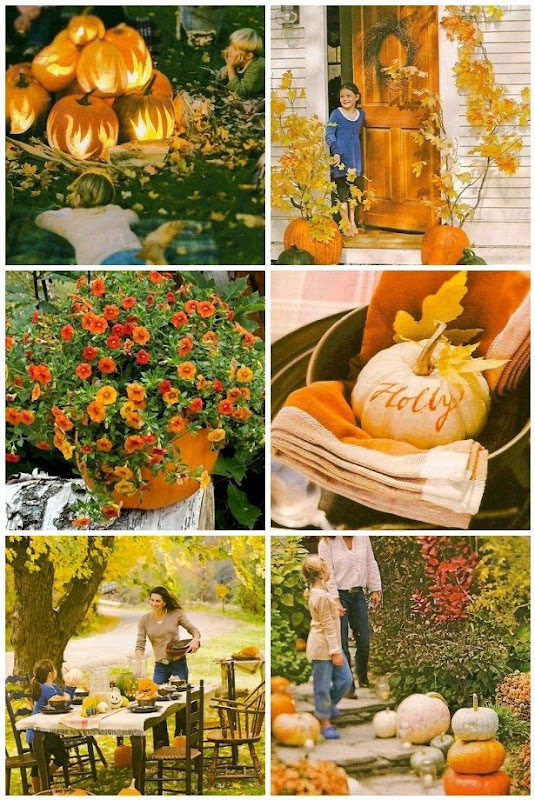 Utilize the cinderella pumpkins, gourds and white pumpkins to the classic orange ones to evoke an Autumn scheme. The mini pumpkins, are great place-card holders at your holiday dinners or fill a large vase with several of them for a dramatic effect. You can also use your pumpkins as floral planters, simply empty them out, fill with soil and plant your favorite fall flowers or plants. A fun family use for all those pumpkins is to collect them, fill with electric candles and great a bonfire with friends. The point is not to waste all those beautiful pumpkins, you can find many ways to incorporate them into your decor post Halloween well into Thanksgiving! I love color when it comes to wedding flowers. It makes such a bold statement and livens up any reception room or ceremony site. 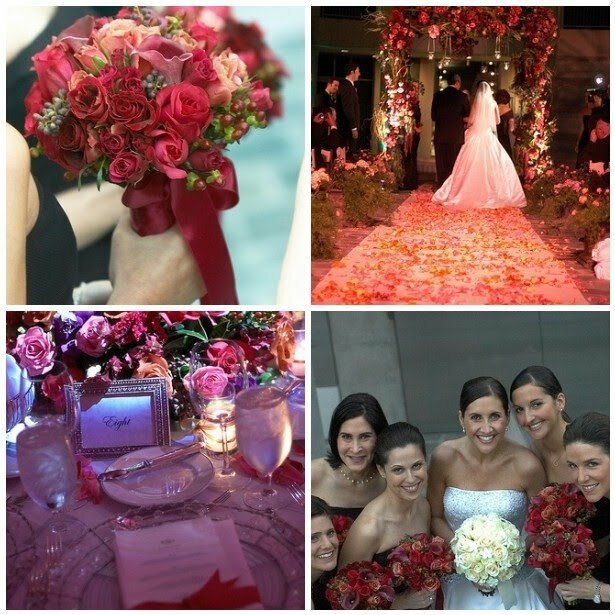 It makes your guests swoon with delight when they see the flowers....bold colors are unexpected. They are candy for the eyes....it brings the drama to the table, the warmth to the ceremony and the glow to the overall ambiance. Some of the color combinations created today might be "dated" next year. It's a chance you are taking but i think it is worth it if you are looking for a big bang with your florals! Don't get me wrong, you can never go wrong with the classic traditional white color palette. White is safe. It is a classic palette that will never go out of style (the design of the florals might but the color is timeless). And if you are confused on which to choose...you could always go white at the ceremony and spice it up with bold colors in the reception! The best of both worlds.